It takes a special kind of moxie to launch a venture fund straight out of college — Mike Rothenberg was only 28 when he raised the money to launch the fund that bears his name. He proved gifted, participating early in rounds for AngelList, Gusto, and Robinhood; the last two of which are now unicorns (Robinhood increasing 100x in value since his fund invested). This was all before refining his investment strategy, narrowing his focus on “frontier technologies,” including AI, space & aerospace, drones, robotics, and yes: augmented and virtual reality. In the later case, Rothenberg invested in Matterport when Oculus was still a Kickstarter project, and was the lead investor in AltSpaceVR’s seed round. By 2014 Mike doubled down, announcing 10 more VR investments, solidifying his commitment to the category and leading the investment community, who followed fast down the path he had blazed — 44 total VR & AR investments to date, including WeVR, Jaunt, and 8i. By late 2015 TechCrunch boasted that Virtual Reality was reaching “critical mass.” VR was destined to go mainstream. The hardware and core technologies had finally begun to catch up to the vision. In the exuberance of it all few took note of a glaring weakness in the ecosystem — VR content can be expensive to produce — and with only a small early-adopter user base, content creators were moving slow to make the commitment. Rothenberg took note. If there were not enough users, content developers could not make enough money to justify the investment, and if content creators weren’t making the investment then the content wasn’t there yet to drive hardware adoption. Understanding the need for compelling VR content Mike Rothenberg launched River Studios to get ahead of this chicken-or-egg dilemma that can cripple a nascent medium. River Studios as an entity was technically founded in late 2014, but only became active in earnest in April 2015 when they began hiring employees. Initially funded with money from Mike Rothenberg’s own pocket, his venture fund did not invest until the following April of 2016. By this time the studio was both already revenue positive, had outside investment, and had executed 20 projects for clients including NBC Universal, TIME Inc., Coldplay, the Sacramento Kings, the Denver Broncos and others. It was during this time that a 27-year-old IT employee named Francisco Riordan joined Rothenberg Ventures, and subsequently contacted the SEC virtually upon being hired, ultimately triggering an investigation. At the time of his hire, Riordan was himself looking for work because the CFTC, a government body that regulates commodity trading, had just shut down his own startup, Coinflip. In a recent interview with Bloomberg, Riordan invited the hosts to his home. There they noted a book on his shelf titled, “The Whistleblowers Handbook,” to which, for some reason Riordan made pains to assure his interviewers he had only read after his time at Rothenberg Ventures. That seemed an odd point to be so adamant about. A basic search of the book shows 132 instances detailing how to collect reward money. Would a founder who had just had their own startup shutdown by a government regulatory agency, suddenly familiarized with the law, see opportunity in failure and seek out a firm as a mark? It is worth noting that whistleblowers play a valuable role in exposing corporate malfeasance, and those that do are often subject to career retaliation. Furthermore, a whistleblower with ulterior motives who none-the-less uncovers malfeasance certainly does not absolve the subject of an investigation of wrongdoing. In the wake of the SEC investigation, the tech press has also chronicled Rothenberg Ventures’ other legal woes. In October of last year TechCrunch reported that a former Rothenberg Ventures employee, Katie Fanelli, had brought litigation against Rothenberg Ventures alleging “it failed to compensate Fanelli and other hourly workers for overtime.” But when her EDD claim not only failed in court, but Fanelli was found to have committed fraud in the case, it was somehow not deemed worthy of reporting. Further coverage of Rothenberg Ventures’ tribulations has also been rife with inaccuracies. In August of last year the Wall Street Journal reported that Mike Rothenberg had stepped down from his firm and was then forced to publish a correction. Other outlets reported that his LPs were not informed that he was investing Rothenberg Venture funds in his own startup, River Studios. In the course of writing this article I have been provided with documents from Rothenberg Ventures showing that their LPs were in fact explicitly notified of the investment. Though the investigation has clearly occupied resources and time, Rothenberg Ventures has closed another notable investment since the probe began. In October of last year they participated in the seed round of social VR platform VRchat — notable because it predated Facebook’s announcement of their own social VR platform, Facebook Spaces, by six months. Even operating while under the bright light of SEC scrutiny, Rothenberg remains the most forward thinking early stage investor in the Virtual Reality space. The SEC investigation of Rothenberg Ventures began almost a year ago, a millennia in tech time. In that time the demeanor of the headlines covering the VR industry have decidedly changed. The twin mantras of the day? 1. Compelling virtual reality content is lacking, and holding back industry growth. Which investor was addressing this problem head on, by creating and funding a VR content production studio, initially seeded with his own personal funds? 2. Investment in virtual reality has cooled, with far fewer deals than the year prior. Of course it has, with VR’s single largest investor in the category sidelined, there is now a Rothenberg-size hole in the VR investment category. Adding to the current malaise, VR media outlet UploadVR has just been hit with a gender discrimination lawsuit. Seldom is it mentioned that Rothenberg Ventures has one of the most progressive inclusivity track records not just in VR, but in the whole of the tech industry — funding women founders like Yuka Kojima of FOVE, and Nonny de la Pena of Emblematic Group; funding Jane Poynter of World View Enterprises, and Joanna Weidenmiller of 1-Page (a successful exit with 20x returns in only two years); funding Zooey Deschanel, Sophia Rivka Rossi and Molly McAleer — the all women founding team of Hello Giggles boasting a 100% annual IRR; and the list goes on. Rothenberg’s commitment to inclusivity is also reflected among his accelerator’s mentors. Even the aforementioned River Studios near the center of the drama has a woman, Dulce Baerga, at its helm. None of which has ever been mentioned, as Rothenberg has never touted it. There is simply no other fund that has been feeding the mouth of the funnel in the virtual reality space as has Rothenberg Ventures. These are the startups that will grow to become the future Oculus and Metaio exits in years to come. As the companies in the Rothenberg Ventures portfolio mature, this fund’s value will increase exponentially, and there are a lot of people that would love to be in control of that fund — when someone is down, the long-knives come out — it is my estimation that this accounts for much of the drama swirling around the firm in the wake of the SEC investigation (this and schadenfreude on the part of onlookers). The attempts to unseat Mike have thus far not succeeded and I will predict here that they will come to naught. The only relevant legal matter at hand is the SEC investigation itself, and for this I would council for a presumption of innocence until and unless any actual misdeeds are disclosed. With UploadVR quagmired in gender discrimination litigation, with a shortage of quality VR content being published to support the hardware devices, and with Rothenberg Ventures’ absence from investment felt painfully by the industry, it is time for Mike Rothenberg to return from the mountain. In Silicon Valley as in America itself, the only thing that we love more than the fall of the great, is a great comeback story. 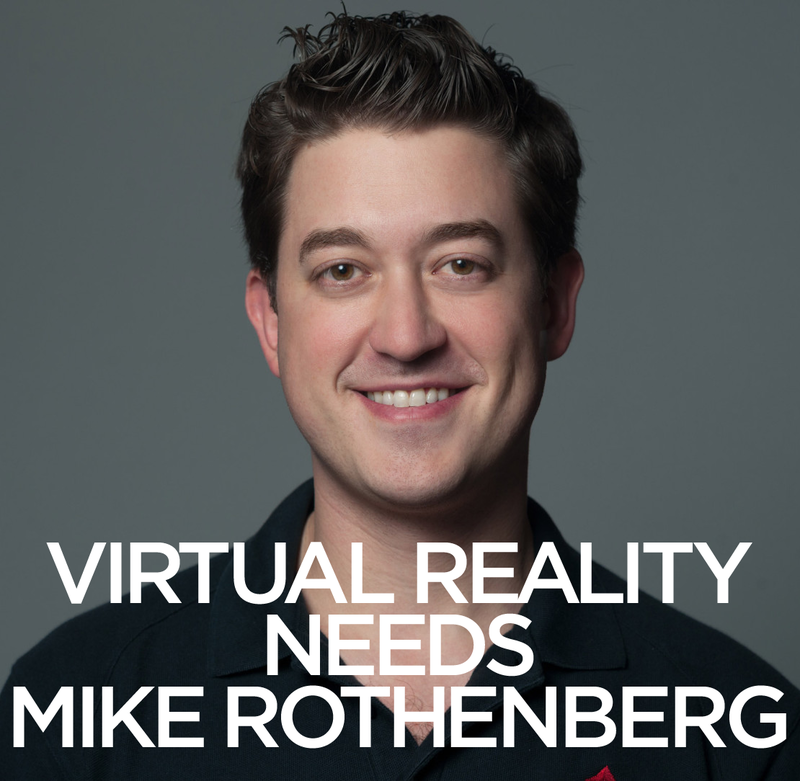 Virtual reality needs the vision, the inclusive values, and the investment of Mike Rothenberg and Rothenberg Ventures. The River Accelerator program is currently accepting applications from frontier tech startups for the Fall 2017 season. The River Accelerator program is operated by River Ecosystem LLC, the events and consulting company Mike founded in September of 2016, which has partnered with Rothenberg Ventures as the startup funding partner. River Ecosystem is also accepting applications to the River Lounge, the creative space in SOMA for frontier tech startups, and for the River Network, the membership for founders, investors, and supporters to build frontier tech startups. The River Network’s fourth annual Founder Field Day at AT&T Park will be held in November this year. Founder Field Day is also accepting applications. This OpEd is available to republish under creative commons license (CC BY-NC-SA 3.0 US). Christopher Grayson is a consultant market analyst in AR/VR who came to the tech industry after a career in advertising, servicing the accounts of SAP, IBM, Time Warner Cable, and award winning work for Nikon and Intel; before pivoting into tech startups as Executive Creative Director of Telepathy, the Tokyo based maker of smartglasses. He is a former co-organizer and recent track host at Augmented World Expo, who has lectured on augmented reality at SXSW, NASA Jet Propulsion Laboratory, Parson’s New School of Design, and MIT Media Lab.